Brian O'Donnell Quality Home Improvements proves that there is a difference from one Canton roofing contractor to another. Brian, having started his business back in 1978, has been a part of the local community ever since. He has gained recognition for his honesty, knowledge and willingness to provide the very best solution. This approach is refreshing to homeowners who are used to a more high-pressure sales tactic. Brian, and all of the team here, stands behind using only the best in products as well. We use CertainTeed shingles which are known for high performance that is ideal for our region and climate. This is the perfect choice for enduing the tests of time and holding up beautifully. Homeowners often ask us what makes our name the number one choice for roofing services in Canton, CT. There are plenty of reasons, including details about the quality of work and customer care we provide. Of course our more than fair pricing system doesn't hurt either. Yet it is also about the fact that Brian practices clean and responsible construction. We separate and recycle 99% of our building material so that it does not got into the landfill. We treat your project with the care and respect that we would treat our own, including taking care of environmentally responsible measures. One of the biggest decisions that you may have to make is about whether or not to repair or replace. When you work with a reputable roofing contractor, this is not something that you have to worry about. You will know that we have your best interest in mind and only want you to make the best choices possible. Yet too many less than reputable roofing contractors simply push in the direction of replacement because it earns them more money. We always offer advice but the decision is ultimately yours to make. This is your home and your decision to make, we are just there to carry out the work you decide upon. We make it a point to educate each of our clients about the choices that they have. You should still be able to make your choices as a wise homeowner and a savvy consumer. We just don't want you to ever feel as though you are being pressured one way or another. From roof inspections to storm damage and roof repairs to complete roof replacement, you can rely on our roofers in Canton, CT to take care of your roofing needs. Brian O'Donnell Quality Home Improvements is also the local leading service provider for skylights in Canton, CT, in addition to general roofing services. In fact, Brian is one of the only Velux 5-Star Certified Skylight Specialists in the area. Each years we carry out hundreds of jobs for skylights. Brian prides himself on the quality workmanship that is possible due in part to the ongoing continuing education that helps us stay ahead of the changing technology for this industry. Most of our installations can be executed in a day and a half. It goes without saying, We use Velux Skylights for both new cut-in skylights as well as replacements. This brand offers a 'No Leak Skylight' guarantee for new skylights. Plus, there are countless options for solar powered, curb mounted or deck mounted skylights. Customers can opt for additional decorative shades or blinds to offer their own personal flair. 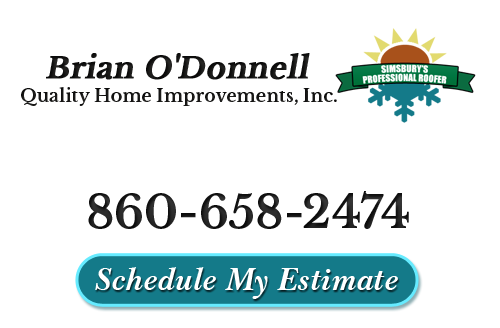 When quality matters, Brian O'Donnell Quality Home Improvements is the name to know. And, when it comes to your home, quality should always matter. "Brian – the roof is beautiful. I thank you for your help in making the right choices. Tim & Donnie made it look easy, did a great job & cleaned up each day. I appreciate the good service you provide!" "I wanted to send you a note to say you have a great team and they are very comfortable to be around. The roof and the wrap looks great -- better than I thought it would and far nicer than I could have done myself. I can't wait to see the final product. We couldn't be happier with our choice to go with your company." If you are looking for a professional Canton roofing contractor then please call 860-658-2474 or complete our online request form.